AirAsia is attempting to turn around its struggling operations in the Philippines by closing its base at Manila alternative airport Clark and focusing on expansion at Manila Ninoy Aquino International Airport using slots held by new partner Zest Air. AirAsia is also seeking approval for Zest to adopt the AirAsia brand, giving the LCC group two carriers in the Philippine market but a single product. AirAsia has struggled in the Philippine market since it launched Philippines AirAsia in Mar-2012. The new affiliate’s base at Clark has been highly unprofitable with limited growth opportunities. Shifting focus to Manila significantly improves AirAsia Group’s outlook in the Philippines. But AirAsia will still need to overcome intense competition from market leader Cebu Pacific, which has a much stronger position at Manila, as well as the Philippine Airlines Group and Tigerair Philippines. Philippines AirAsia (PAA) launched services on 28-Mar-2012, ending a rocky pre-launch phase which included a costly delay in the certification process. PAA, which is 40% owned by Malaysia-listed AirAsia Berhad, initially planned to launch services in Oct-2011 and was forced to keep its first A320 on the ground for seven months after being delivered in Aug-2011. During the extended pre-launch phase, PAA incurred losses of MYR27 million (USD9 million), according to AirAsia Berhad financial reports for 2H2011 and 1Q2012. PAA has since continued to struggle, racking up net losses of MYR117 million (USD38 million) over its first 15 full months of operations (1-Apr-2012 to 30-Jun-2013). The carrier transported 551,000 passengers during this period, according to AirAsia Berhad and Philippine CAA data. As a result, PAA has so far incurred an average operating loss of MYR212 (USD68.50) per passenger. This excludes pre-launch start-up costs and the first four days of operations, which occurred at the end of 1Q2013 and saw the carrier’s first 2,700 passengers. AirAsia’s troubles in Japan have been more in the spotlight over the last year, ending with the group’s Jun-2013 decision to dissolve AirAsia Japan, which launched services in Aug-2012 and will operate its last flight under the AirAsia brand at the end of Oct-2013. But the group’s troubles in the Philippines have been just as serious and significantly more unprofitable on a per passenger basis although not nearly as high profile. In attempt to reduce the losses, PAA implemented several network adjustments over the last year with an increased focus on the international market, where it is able to leverage AirAsia’s strong regional brand. PAA launched operations with domestic services on three routes – Clark to Davao, Kalibo and Puerto Princesa. But Puerto Princesa was dropped after only eight months and capacity to Davao and Kalibo was reduced. 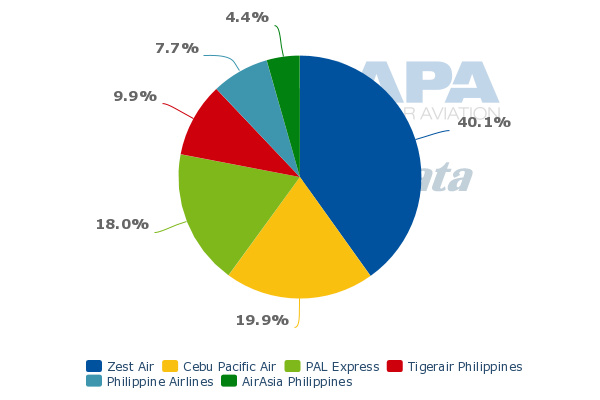 In 2012, domestic routes accounted for 59% of the 269,000 passengers carried by PAA, according to Philippine CAA data. 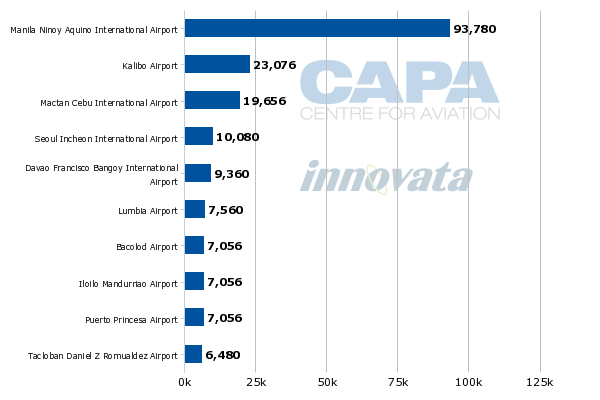 But for most of 2013 PAA has allocated only 31% of its seat capacity to the domestic market. In recent weeks its domestic allocation has gone up to 44% as it quietly dropped service from Clark to Kuala Lumpur and Singapore, giving it a one-aircraft schedule. PAA’s current domestic schedule includes only seven weekly flights to Kalibo and four weekly flights to Davao while its international schedule includes 10 weekly flights to Hong Kong and four to Taipei. In addition to the recent suspension of Kuala Lumpur and Singapore, PAA dropped service from Clark to Kota Kinabalu and Macau on 1-Apr-2013. The network changes from April and latter part of 2012 along with the increased focus on international operations failed to yield significant improvements. In all five of the full quarters the carrier has operated, the losses have ranged from MYR20 million to MY26 million although PAA has seen an improvement in load factors and an increase in passenger numbers. In the most recent quarter, 2Q2013, PAA incurred a net loss of MYR24 million (USD7 million) and reported a seat load factor of 74% with 140,000 passengers transported. With the losses at PAA continuing despite the network changes, it became obvious that carving out a profitable and sustainable niche at Clark was a near impossible mission. From the beginning competitors and sceptics doubted the PAA business plan would succeed as carriers have struggled over the years to stimulate demand at Clark given the large supply of LCC capacity at more convenient Manila International. AirAsia repeatedly expressed confidence in Clark, particularly for the international market, and in early 2013 remained optimistic stating that a new shuttle bus service from the local airport authority would improve connectivity with central Manila. But once an opportunity emerged to establish a presence and potentially move entirely to Manila International, which AirAsia was initially unable to access due to slot restrictions, the AirAsia Group and PAA pounced. The opportunity came in the form of a quasi-merger with independent LCC Zest, which has the third largest portfolio of slots at Manila International after the Philippine Airlines (PAL) Group and Cebu Pacific Air. PAA initially forged a partnership and equity tie-up with Zest in a Mar-2013 deal that resulted in PAA taking a 49% stake in Zest. Zest has continued and will continue to operate separately from PAA but plans to take on the AirAsia brand by the end of 2013. Zest-operated flights are already sold on the AirAsia website and Zest has been working in recent months to adopt the standard AirAsia product. Initially the separate PAA operation remained at Clark. But with the Clark hub struggling financially and some expansion opportunities available at Manila as Zest is not fully utilizing its slots, PAA decided to shift entirely out of Clark. AirAsia Group CEO Tony Fernandes made the announcement on 17-Sep-2013 with a Tweet, saying PAA’s move to Manila will provide “more choice, more value”. PAA is dropping flights from Clark to Davao, Kalibo, Hong Kong and Taipei in early Oct-2013. The AirAsia website shows that PAA has already stopped operating Clark-Kuala Lumpur, which it served with one daily flight, although its sister Malaysian carrier will continue to serve the route with three weekly flights. The last PAA flight at Clark currently sold on the AirAsia website is 8-Oct-2013 although flights to Hong Kong are again available from 20-Dec-2013 and 6-Jan-2014. These are expected to operate only for the Christmas season with PAA operating only out of Manila from 9-Oct-2013 to 19-Dec-2013 and again from 7-Jan-2013. AirAsia has not yet stated which flights PAA will initially operate at Clark. Zest already serves Davao, Kalibo and Hong Kong from Manila. AirAsia passengers that had booked on now cancelled flights to these destinations from Clark are being given the option of re-accommodation on Zest flights from Manila or refunds. Zest currently operates 13 routes from Manila, including nine domestic routes and four international routes – Kuala Lumpur and Kota Kinabalu, both of which are AirAsia Malaysia hubs, along with Shanghai and Seoul. PAA aircraft initially may be used to operate some Zest flights on the 13 existing Zest routes. PAA has already been helping Zest’s operation recover from a four-day suspension in Aug-2013, which occurred when Philippine authorities grounded the Zest fleet citing various violations. The suspension was costly for Zest, leading to a reported USD100 million recapitalisation which was supported by all shareholders including PAA. With PAA’s upcoming move to Manila, PAA hopes to reduce costs at a critical juncture by pursuing a more integrated operation with Zest. This should improve the financials of both carriers. While PAA has consistently been in the red since its Mar-2012 launch, Zest also has struggled financially and prior to the AirAsia deal had been seeking new investors for a couple of years. Both carriers are optimistic that combining at Manila will improve their fortunes. Zest currently operates a fleet of 11 A320s while PAA operates only two A320s, which is the same number of aircraft it launched with in Mar-2012. AirAsia Berhad has repeatedly delayed plans to allocate additional A320s to PAA as the carrier has struggled financially. Over the last year the group has instead been focusing on expanding the fleets of its three much larger, more established and profitable affiliates or subsidiaries in Southeast Asia. But with the Zest tie-up and PAA’s forthcoming move to Manila, the group is more willing to expand the fleet of the Philippine operation. In its 2Q2013 results statement, AirAsia Berhad stated that the combined PAA/Zest operation will expand to 16 A320s by the end of 2013. PAA and Zest could pursue some domestic expansion from Manila and the two carriers are also currently looking at launching flights from Manila to Japan. While additional slots are not currently available Zest has some slots at its disposal that were previously used for turboprop flights to Busuanga, Marinduque, Masbate and Tablas. Zest dropped these four destinations in May-2013 as it phased out its fleet of five Xian MA60 turboprops. The decision to retire the turboprops and operate an all-A320 fleet came shortly after the tie-up with AirAsia, which believes having one aircraft type across the group is critical for maintaining a pure low-cost model. Tigerair similarly gained access to Manila International in mid-2012, after taking over slots that had been used by SEAir on turboprop routes. Tigerair Philippines is now using the slots to operate six domestic routes from Manila using A319/A320 aircraft. Singapore-based Tiger Airways Holdings and Philippine partners acquired SEAir in 2012. The carrier immediately phased out its turboprop fleet and more recently adopted the Tigerair brand. Tigerair Philippines currently has a 5% share of domestic seat capacity at Manila, making it by far the smallest of the four main players in the Philippine domestic market. 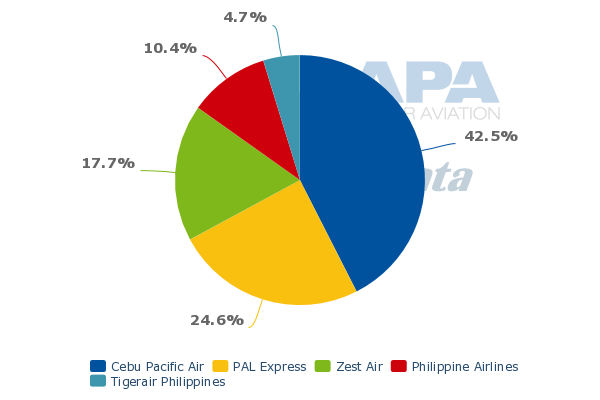 Cebu Pacific has a leading 43% share of domestic capacity at Manila while the PAL Group has a strong 35% share (includes PAL and regional subsidiary PAL Express). Zest currently has an 18% share. 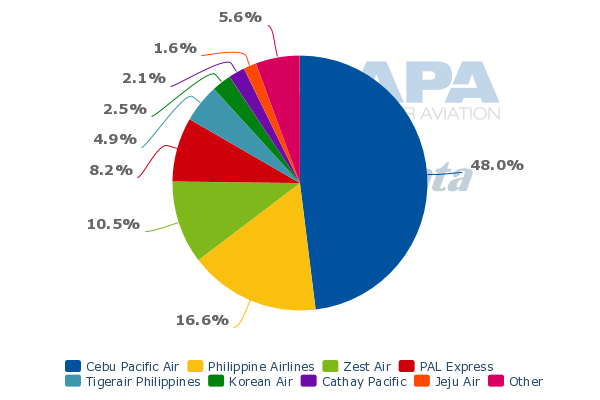 In Manila's international market, the PAL Group currently has a leading 29% share of capacity while Cebu Pacific has a 17% share. Zest has only a 2% share while Tigerair has just 1%. 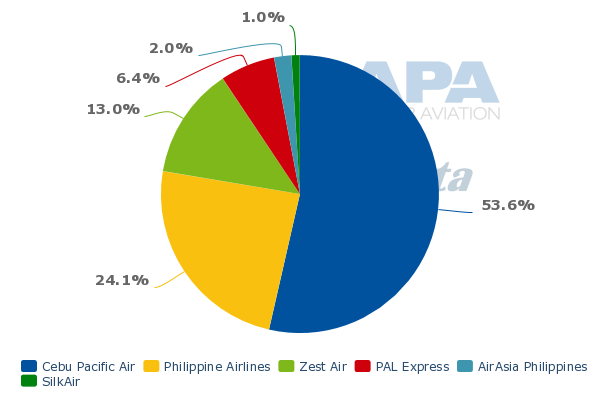 In terms of total peak-hour slots that are currently used, the PAL Group currently controls 38%, Cebu Pacific 35%, Zest 12% and Tigerair 3%. However, as AirAsia looks to expand its position in Manila there is no guarantee the profitability of its Philippine operation will finally improve. As Tigerair’s experience has proven, the Manila market is intensely competitive. Tigerair Philippines has consistently been in the red since launching domestic trunk routes from Manila in mid-2012. In its first year in the Manila market (year to 30-Jun-2013), Tigerair Philippines incurred losses of SGD62 million (USD48 million). As is the case with PAA and AirAsia, the losses have prompted the Tigerair Group to repeatedly delay fleet expansion at Tigerair Philippines. The carrier currently operates two A319s and three A320s and has not added any aircraft for over a year. Zest is bigger but also has been unprofitable. AirAsia is optimistic the Zest-PAA combination will lead to profitability starting in 2014 but the group will still be in a relatively weak albeit improved position in a market which has in recent years only seen consistent profits at market leader Cebu Pacific. Cebu Pacific has successfully exploited its first mover LCC advantage, an advantage AirAsia is very familiar with as its first mover position in Malaysia and Thailand have led to steady profitability at its more established affiliates and subsidiaries. The PAL Group also continues to be a fierce competitor despite the transitioning in early 2013 of its subsidiary PAL Express, previously known as AirPhil Express, from LCC to regional full-service hybrid carrier. PAL Express now operates most of the group’s domestic routes and offers frills. But on price the PAL Group continues to compete aggressively with LCCs – which is essential as the Philippines is a price conscious market with limited premium demand. To further boost its competitiveness in the domestic market PAL and PAL Express on 18-Sep introduced a new simplified pricing structure which includes a new budget fare class aimed at competing directly with LCCs. Passengers travelling on this fare class will still have access to normal economy class seats and be served snacks and drinks but will not be offered complimentary checked bags or frequent flyer miles. While PAL is investing heavily on international expansion, including the launch of flights to London, the group remains committed to the domestic market and does not want to see its market share slip further. A strong Cebu Pacific and an invigorated PAL will make it hard for any smaller player to carve out a sustainable niche in the key Manila market. The smaller carriers have repeatedly struggled over the years and have an uphill battle to overcome the two leading groups in the market, which have the scale, the muscle and initiative to leverage their strong positions. Kalibo is a logical choice for expansion as Zest is already by far the largest carrier at the airport, which is a gateway to the popular resort island of Boracay. Kalibo currently has Zest’s second largest operation after Manila. Zest currently accounts for 40% of total capacity at Kalibo with PAA accounting for another 4%. Zest operates between seven and eight daily flights on the Manila-Kalibo route, providing almost as much capacity as the other four carriers on the route combined – Cebu Pacific, PAL, PAL Express and Tigerair Philippines. Zest also already operates two daily flights from Kalibo to Seoul. PAL currently operates one daily flight from Kalibo to Seoul and two weekly flights to South Korea’s second largest city, Busan. Rival Tigerair Philippines also has been pursuing international growth at Kalibo, launching flights in recent months to Singapore and Beijing, Nanjing, Ningbo and Shanghai in China. Tigerair’s China routes do not operate year-round; other Philippine carriers including Zest also operate some seasonal flights from Kalibo to various mainland Chinese destinations as well as Hong Kong and Taipei. Kalibo is the fourth largest airport in the Philippines after Manila, Cebu and Davao. AirAsia expansion in other major secondary Philippine cities such as Cebu and Davao is riskier as the Zest/PAA share at these airports is smaller. Competitors also already have bases in Cebu and Davao and have been expanding these bases due partially to congestion at Manila. Zest has an approximately 11% share of total capacity at Cebu and a 13% share at Davao while PAA does not serve Cebu and has just a 2% share at Davao. 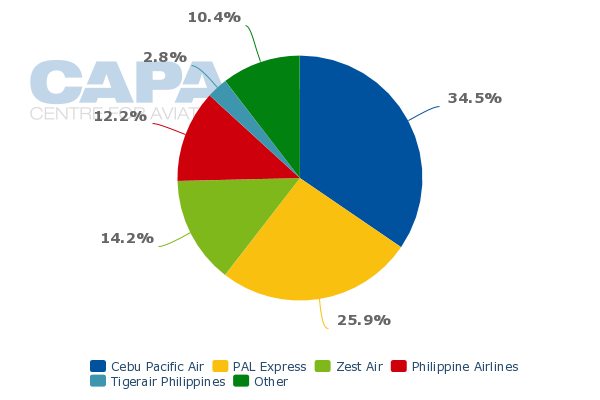 Cebu Pacific is the market leader at both airports with a 48% share at Cebu and a 54% share at Davao. Meanwhile, Clark will see a fall in domestic traffic but a gain in international traffic as Emirates and Qatar Airways both launch services. PAA is currently the largest carrier at Clark with 9,000 weekly seats, down from 14,040 two months ago. PAA currently accounts for 35% of total seat capacity at Clark and the AirAsia brand accounts for 39% (includes 4% for AirAsia Malaysia). Tigerair is currently the second largest airline group at Clark with a 25% share of capacity followed by Cebu Pacific with 20%. Nearly all of Tigerair Philippines’ international operation remains at Clark as it lacks sufficient slots at Manila. Tigerair Philippines currently serves Bangkok, Hong Kong and Singapore from Clark as well as one domestic route to Kalibo. Cebu Pacific, which has maintained a one aircraft base at Clark primary as a defensive move as it sees having a large Manila hub as a critical component of its model, links Clark with Hong Kong, Singapore, Macau and Cebu. Clark is currently only served by three foreign carriers besides AirAsia Malaysia – Asiana and Jin Air from South Korea and Cathay Pacific regional subsidiary Dragonair. But in Oct-2013 Emirates and Qatar Airways are both launching service to Clark, providing 9,300 weekly seats – almost enough to offset the loss of PAA. Tigerair Philippines will be the largest carrier at Clark in Nov-2013 but Cebu Pacific, Emirates and Qatar will be only slightly smaller. Clark is currently the 10th largest airport in the Philippines based on current seat capacity. The airport’s track record of trying to become a large alternative hub airport has so far been far from stellar with the PAA pull-out the latest setback. Even with congestion at Manila intensifying in recent years, attracting passengers to Clark has remained a challenge. Emirates and Qatar provide a welcome new influx of business but have been primarily drawn to Clark for its open skies as all three major Gulf carriers are currently unable to expand at Manila due to bilateral restrictions. If later provided with additional access at Manila, Emirates and Qatar could end up following PAA in retreating from Clark. This shows there is still a niche for Clark but not for a hub carrier. AirAsia had huge ambitions for Clark but it struggled there and once an opportunity in Manila opened up the business plan for its Philippine affiliate was quickly re-written. AirAsia’s position and outlook in the dynamic Philippine market instantly improves as PAA moves from Clark to Manila. But by no means is Philippines AirAsia or its new sister carrier Zest Air out of the woods.